This is really awesome and easy. 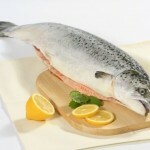 We have fresh salmon in the store most Friday's in the meat department. This is from Kraft Canada recipes Summer 2014. Heat the BBQ to medium, is the recommended recipe method, however I am sure you could bake this in a hot oven or pan fry with a lid also, depending what you have. Combine first 4 ingredients with 3 tbsp. of the dressing and set aside. If using the BBQ, spray a sheet of heavy duty foil with cooking spray, and place the foil on the BBQ grate. Top with the salmon, flesh side down and skin up. Grill for 5 minutes and then turn the salmon over. Brush with the remaining Kraft dressing. Top with the tomato mixture. Grill 18-20 minutes or until the salmon flakes easily with a fork. Top with basil.